Applications are now invited for ReDefine Next 100 Global Youth Program 2019 in the Czech Republic. ReDefine Next 100 Leadership Program challenges young leaders to think outside the box and look at the world through the lens of opportunity, promoting the use of technology and innovation to address global challenges. This is an unparalleled opportunity for young leaders committed to making a real impact on society through technology and innovation. challenge in the future. GARI will put the selected candidates into diverse international teams, that incorporate innovative ideas from various respective fields and propose a way to address a global challenge. Teams will be invited to Prague for a five-day-long workshop in September 2019, where they will refine their work with the guidance of high-level mentors. At the end of the ReDefine September program, GARI will choose the best teams/projects, with the most innovative and applicable idea and invite them back for the November programme as well as to present at The Next 100 Symposium. ReDefine Next 100 2019 in Prague (Czech Republic) from September 6 – 12 and November 14 – 22. Applicants who are selected can then apply for a partial or full scholarship. Applicants can fund their own participation or seek a sponsor on their own. Your passion, experience, and potential in innovation & technology and how it can be applied in your chosen field/topic of engagement/project. Your knowledge of your chosen topic and the relevance of your active engagement. We encourage candidates to show how their activities have had an impact or to articulate the potential impact of their proposed project. Your role as a representative of an organization, other youth or community, and your leadership experience or potential. The originality of the idea and depth of a suggested solution to challenge. Why should you be chosen as a Next 100 ReDefiner? to convince us you are the best candidate for this program by describing your achievements. (minimum of 3,000 characters). What does “innovation” mean to you in 2019 and beyond? What do you perceive as the greatest challenge & opportunity of the future? How would you use & apply innovative approaches as a project/endeavor/idea for transforming those challenges into opportunities? This must be an original new idea written specifically for this ReDefine Application. Proposals for projects that have been written prior to this 8 application, or that were written for other purposes and have been started will not be considered! Submit a 2-4 minute video answering “How can innovative approaches transform challenges into opportunities in the future? (across disciplines) – Please paste the link to the video and make sure access is open, and a password is not required. We recommend uploading the video on YouTube and pasting the link to it below. This must be an original video filmed specifically for this ReDefine application. Videos for projects that have been filmed prior to this application or that were filmed for other purposes will not be considered. This is not mandatory, if you do not wish to submit a video, it won’t disqualify your application, however, we recommend you do, as it most certainly will help it. 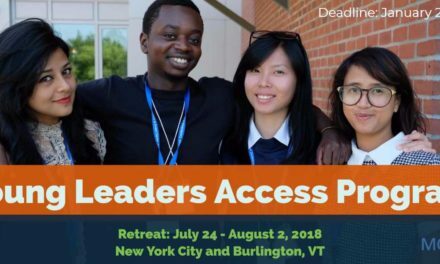 How to Apply ReDefine Next 100 Global Youth Program 2019? Before Applying: Read the Application Guide. Please prepare your answers in advance and copy them into the form when ready, as you will not be able to use this form as a working document or save any of your work before submitting it officially.